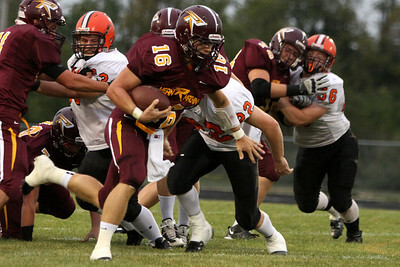 Richmond-Burton lost to Winnebago 44-28 in a non-conference game Friday, August 31, 2012 in Richmond. Mike Greene - mgreene@shawmedia.com Richmond-Burton running back Adam Kinsella runs down the sideline before being knocked out of bounds during the first quarter of a non-conference game against Winnebago Friday, August 31, 2012 in Richmond. Winnebago defeated Richmond-Burton 44-28. 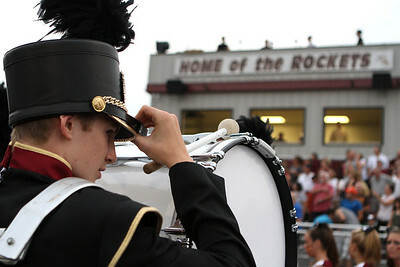 Mike Greene - mgreene@shawmedia.com A Richmond-Burton band member adjusts his hat before the start of a non-conference game against Winnebago Friday, August 31, 2012 in Richmond. Winnebago defeated Richmond-Burton 44-28. 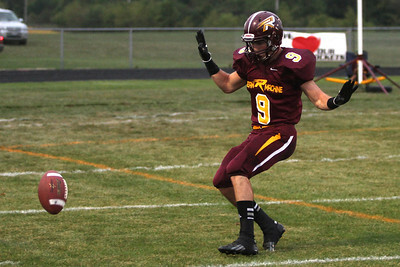 Mike Greene - mgreene@shawmedia.com Richmond-Burton kick returner Adam Kinsella lets the opening kick off go out of bounds during the first quarter of a non-conference game against Winnebago Friday, August 31, 2012 in Richmond. Winnebago defeated Richmond-Burton 44-28. 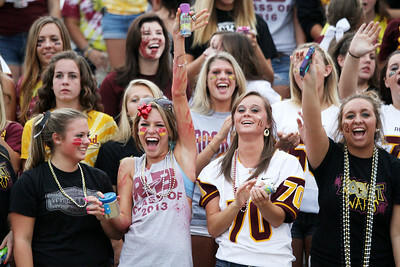 Mike Greene - mgreene@shawmedia.com Richmond-Burton fans cheer during the coin toss before the start of a non-conference game against Winnebago Friday, August 31, 2012 in Richmond. Winnebago defeated Richmond-Burton 44-28. 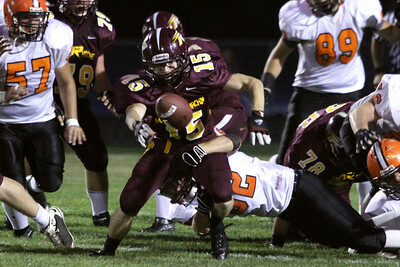 Mike Greene - mgreene@shawmedia.com Richmond-Burton running back Adam Kinsella breaks through the line while rushing during the first quarter of a non-conference game against Winnebago Friday, August 31, 2012 in Richmond. Winnebago defeated Richmond-Burton 44-28. 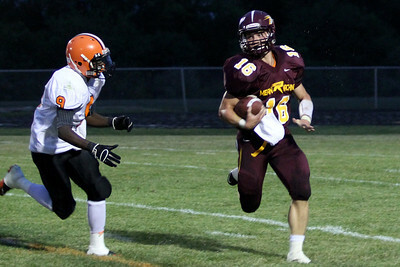 Mike Greene - mgreene@shawmedia.com Richmond-Burton quarterback Matthew Malecki runs past the line during a sneak in the first quarter of a non-conference game against Winnebago Friday, August 31, 2012 in Richmond. Winnebago defeated Richmond-Burton 44-28. 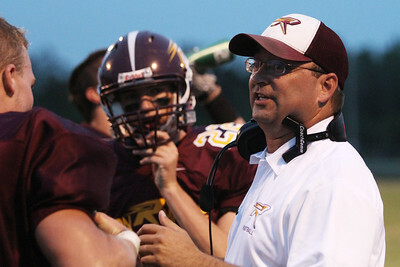 Mike Greene - mgreene@shawmedia.com Richmond-Burton head coach Patrick Elder speaks to his team at the end of the first quarter of a non-conference game against Winnebago Friday, August 31, 2012 in Richmond. Winnebago defeated Richmond-Burton 44-28. 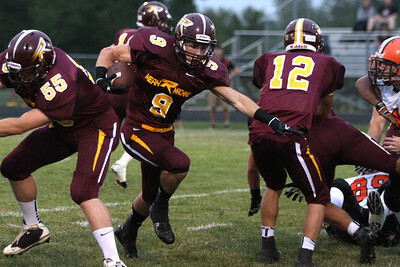 Mike Greene - mgreene@shawmedia.com Richmond-Burton's Adam Kinsella (9) pulls down Winnebago running back Michael Pate with the help of teammate Tyler Aitken (28) during the first quarter of a non-conference game Friday, August 31, 2012 in Richmond. Winnebago defeated Richmond-Burton 44-28. 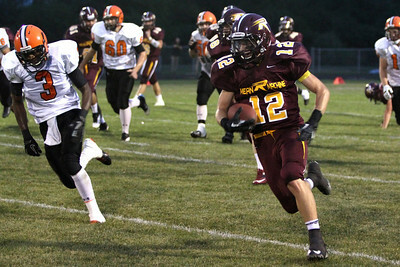 Mike Greene - mgreene@shawmedia.com Richmond-Burton running back Christopher Vlasak outruns defenders en-route to a 69-yard touchdown run during the second quarter of a non-conference game against Winnebago Friday, August 31, 2012 in Richmond. Winnebago defeated Richmond-Burton 44-28. 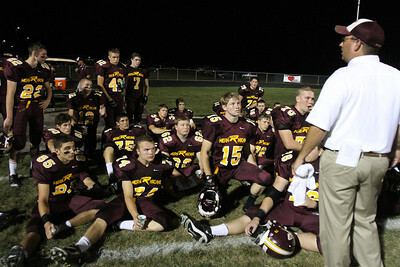 Mike Greene - mgreene@shawmedia.com Richmond-Burton lineman Vincent Battaglia and teammates listen to head coach Patrick Elder during the second quarter of a non-conference game against Winnebago Friday, August 31, 2012 in Richmond. Winnebago defeated Richmond-Burton 44-28. 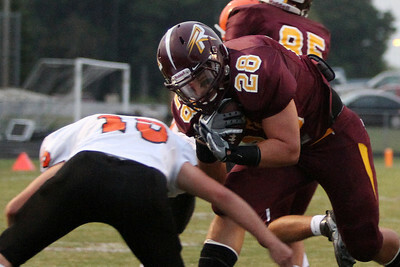 Mike Greene - mgreene@shawmedia.com Richmond-Burton running back Tyler Aitken braces for impact with a Winnebago defender while rushing during the first quarter of a non-conference game Friday, August 31, 2012 in Richmond. Winnebago defeated Richmond-Burton 44-28. Mike Greene - mgreene@shawmedia.com Richmond-Burton running back Sean Kirby reaches for a ball after fumbling during the second quarter of a non-conference game against Winnebago Friday, August 31, 2012 in Richmond. Winnebago defeated Richmond-Burton 44-28. 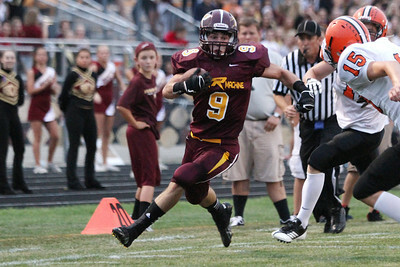 Mike Greene - mgreene@shawmedia.com Richmond-Burton punt returner Matthew Malecki breaks past a Winnebago defender during a return in the second quarter of a non-conference game against Winnebago Friday, August 31, 2012 in Richmond. Winnebago defeated Richmond-Burton 44-28. 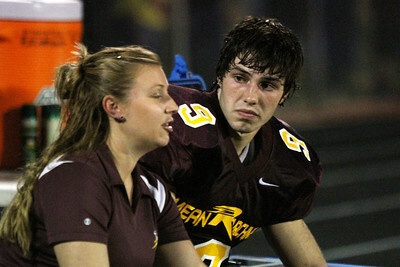 Mike Greene - mgreene@shawmedia.com Richmond-Burton's Adam Kinsella speaks with a trainer on the sidelines after being taken out of a non-conference game against Winnebago after suffering an injury Friday, August 31, 2012 in Richmond. Winnebago defeated Richmond-Burton 44-28. 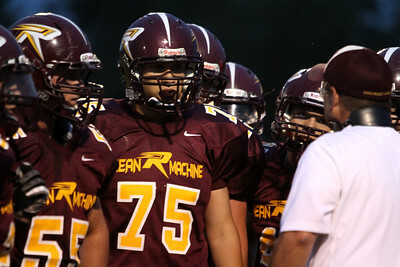 Mike Greene - mgreene@shawmedia.com Richmond-Burton lineman wait for quarterback Matthew Malecki to come back to the huddle with a play before the end of the second quarter of a non-conference game against Winnebago Friday, August 31, 2012 in Richmond. Winnebago defeated Richmond-Burton 44-28. Mike Greene - mgreene@shawmedia.com Members of the Richmond-Burton varsity cheer team perform during halftime of a non-conference game against Winnebago Friday, August 31, 2012 in Richmond. Winnebago defeated Richmond-Burton 44-28. Mike Greene - mgreene@shawmedia.com Members of the Richmond-Burton dance team perform during halftime of a non-conference game against Winnebago Friday, August 31, 2012 in Richmond. Winnebago defeated Richmond-Burton 44-28. Mike Greene - mgreene@shawmedia.com Richmond-Burton players speak with coaches during halftime of a non-conference game against Winnebago Friday, August 31, 2012 in Richmond. Winnebago defeated Richmond-Burton 44-28. 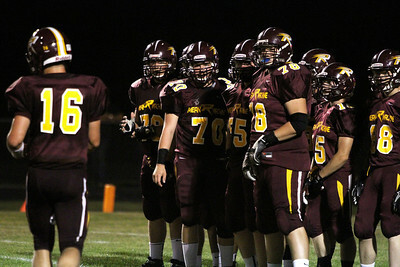 Richmond-Burton lineman wait for quarterback Matthew Malecki to come back to the huddle with a play before the end of the second quarter of a non-conference game against Winnebago Friday, August 31, 2012 in Richmond. Winnebago defeated Richmond-Burton 44-28.